It’s football, so injuries happen. At every school, in every corner of the country. Oftentimes, when a starter goes down, you hear that “next man up” line that everyone likes to use. But at some places, that next man isn’t ready, or is a huge step down in talent and/or experience. The fall-off is obvious, and it often leads to defeats, and lost seasons. That hasn’t been the case at Georgia. And it’s a big reason the Dawgs already won the SEC East and have other lofty goals to still chase. Georgia’s depth has been critical, and it’s usually a true freshman from last year’s top-ranked recruiting class who is making a difference. Cornerback Tyson Campbell took advantage in the fall, and earn a starting job right from the get-go. Offensive lineman Cade Mays filled in early when Andrew Thomas went down at left tackle, and he’s slid over to guard to fill in for Ben Cleveland. Last week, true freshman Trey Hill had to play center almost the entire game against Kentucky after senior Lamont Gaillard (hyper-extended knee) went down. On defense, Jordan Davis has filled in nicely as a starter on the injury-riddled defensive line. The youngsters haven’t just acclimated. They’ve contributed — in a big way. Further contributions will be coming, too. 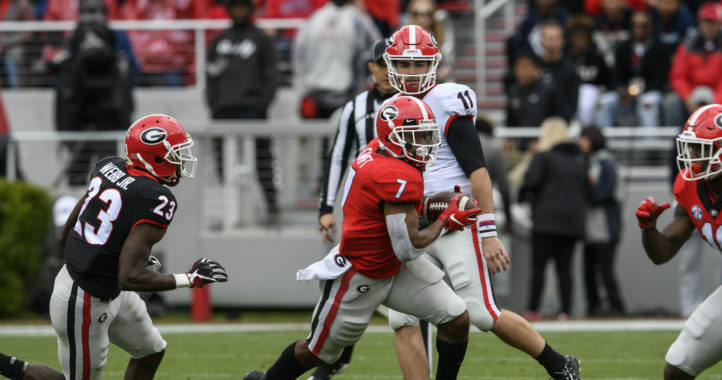 Six other true freshmen — quarterback Justin Fields, guard Jamaree Salyer, safety Otis Reese, and linebackers Brenton Cox, Channing Tindall and Adam Anderson — have gotten a taste thus far, in limited roles. If anything else happens on the injury front, they all could be ready to play a lot, too. That’s a lot of freshmen, but that’s OK when you can recruit like Georgia has the past couple of years. What we often forget, too, is that there are a lot of second-year players in key roles as well. Quarterback Jake Fromm, running back D’Andre Swift and left tackle Andrew Thomas are only sophomores. Right tackle Isaiah Wilson and backup outside linebacker Robert Beal are redshirt freshmen playing key roles. So it’s obvious, yes, but all this young talent means Georgia is going to be good for a while. Recruiting makes a difference (Jimbo). We’ve got to get some momentum with our current class. The loss of Emery and Haselwood hurts big time. There’s a possibility Haselwood re-commits to UGA, Emery I’m not so sure about. But with Cook and White in the class ahead of Emery, it takes some of the sting out of losing him. Haselwood is a strong lean back to UGA. Emery has a couple of “insiders” in his ear and it will be interesting to see how he reaches his final decision. I hope he understands the value of “tailback by committee” IF the NFL is his ultimate end goal. You are absolutely right about the value of tailback by committee. I’m afraid that’s something Benny Snell is going to learn the hard way. High school RB prospects should value being one of the two or three primary backs versus being the sole “featured” back. And in addition to the NFL being the end goal, it also helps keep backs fresh and injury-free late in the season — which is something that I think makes Georgia’s run game particularly dangerous in November and beyond. I think Emery could get a tailback by committee look at LSU as well it’s just the difference of being head of the committee or the tail end of the committee. If you ask me the reason why I think Haselwood might come back and Emery might not, Haselwood decommitted and then looked around and his secondary schools all started to look like dumpster fires. Auburn and Miami especially. With Emery, it’s the opposite. Everyone thought LSU might be down for a few years and coach O might get fired. I can’t blame him for potentially choosing the school he could walk to now that it might not be attached to losing. Eh, I don’t know about at LSU. Hopefully, Gurley, Chubb, and Michel’s outstanding NFL success will keep up and Emery will realize what an opportunity lies at Georgia. I guarantee you that Damien Harris, Josh Jacobs, and Najee Harris will all be very successful in the NFL for the same reasons: learning behind extremely talented backs, playing for an excellent O-line in a pro-style offense, and saving the carries in their bodies for the NFL. Yea, Haselwood may recommit but at running back, we may just focus on a 2020 recruit since we’re stacked at that position thus far. You always want to add depth especially at a position with so much likely attrition. There are several top 10 RBs in the 2019 class still on UGA’s radar. Right now it appears Noah Cain is the main target, but I’d much rather get Emery, since Trey Sanders appears to be a lock to Alabama. I have confidence that Kirby will get us a top 3 class at a minimum. Current class is #3 even with 4 decommit (2 5 stars). Hasselwood Dean, and Webb are still on the table. 2 out of 3 there is HUGE , possible and even likely. This class will be HIGHLY talented. Maybe not #1 given the smaller size but will definitely grow the % of 5 and 4 star talent & depth. We’re solid at virtually every phase but Dline. After this season we will really be thin. There is some talent coming in. I’d like to see some kids at OLB where UGA is stacked try to bulk up and play some true EDGE. And some DEs try to bulk up and move inside. Jordan Davis will be a mainstay for 2-3 more years though so it’s all about adding depth after that. We have some outstanding young talent at linebacker and some very talented pass-rushers in Cox, Anderson, Ojulari, and hopefully we’ll retain and add generational talent Nolan Smith as well as Jermaine Johnson to that group. Hopefully, we can start utilizing that talent and generate some negative plays for once. SECCG twice in a row. I’m a CMR guy but seriously doubt he would have done this. UGA is really way ahead of schedule. Do I have delusions of grand jour : No But, CKS can recruit as well as coach and if he keeps pecking around the top enough , he is liable to find a nut? Gee, thanks for the encouraging heads up. You are wrong. CMR won the East in 02 and 03. UGA won the conference outright in 2017. Just to set the record straight. But, point taken. Mark Rich won the SEC Championship in 2002, his second coaching season. Thank you kirby…. ADB, I wasn’t wrong. Y’all are also forgetting that Richt won the SEC Championship in 2005. 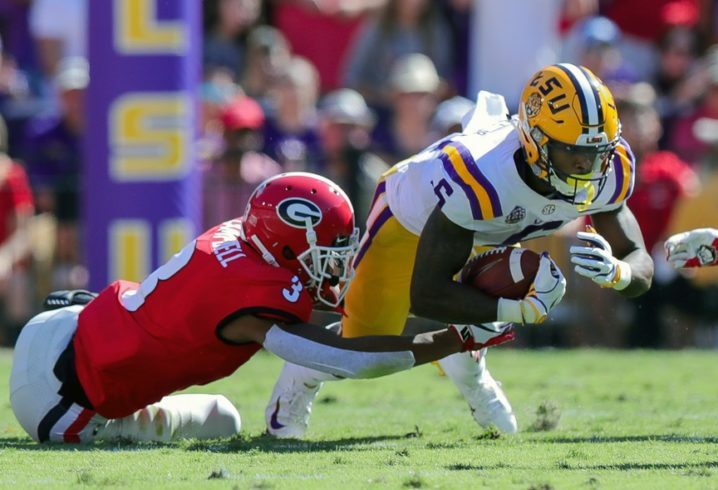 Shockley led UGA to a W against a great LSU team. CMR won the SEC in 02, won the east in 03 and won the SEC in 05. He just didn’t do much after 05 and that odd 07 year. He won the east a few more times during that stretch, but the east was really bad back then. BamaTime follows his sister’s ex boyfriend’s trajectory by boning his sister. From a macro perspective, Kirby is following CMR’s initial trajectory. However, the difference is in the details. In 2002, Richt lost to a Florida team he had absolutely no business losing to and it cost him a chance to play for a NC. Kirby lost to a peaking Auburn team that beat two no. 1 teams in November, but then ultimately got redemption in the SECC. 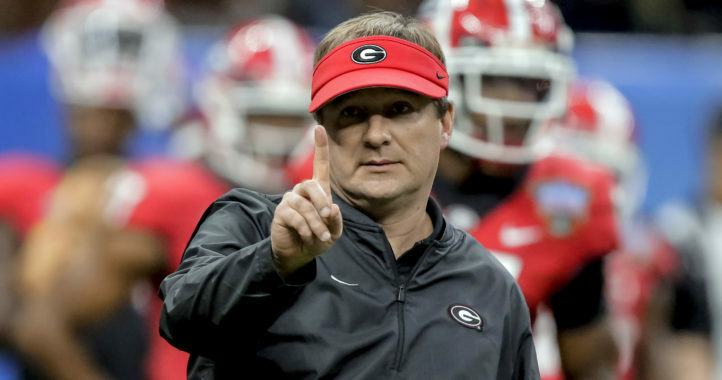 Kirby is recruiting in a manner CMR never did and the 2018 season is, so far, better than CMR’s 2003 season. I would very much pump the breaks on drawing any real comparisons between the two other than high-level coincidences. I thought injuries and lack of depth is why LSU prooved they were the better team earlier this year?